I am still on a high from my week long vacation in Colorado! We had such an amazing time- more so than usual I think. The week was pretty stress-free, we snowboarded every day and relaxed at night. We ate out, a lot, because we were just too tired to cook when we got home. One night we decide to walk around downtown Breckenridge. We went to this awesome crepe house that was located on Main Street in Breckenridge. It was so cute and their menu was huge! 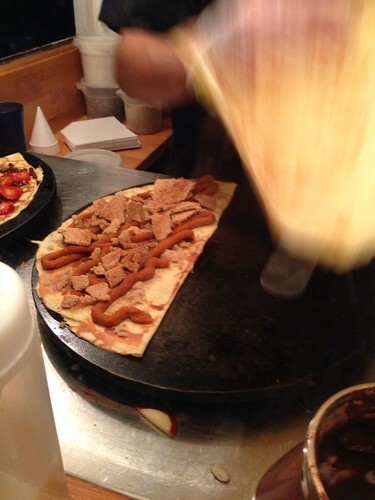 Everything you could ever dream of in a sweet or savory crepe. I was trying to understand how they offered such a big menu in such a small place. They even had a fire pit outside so I could stay warm while I waited for my crepe- PUMPKIN PIE! It was the size of my face. 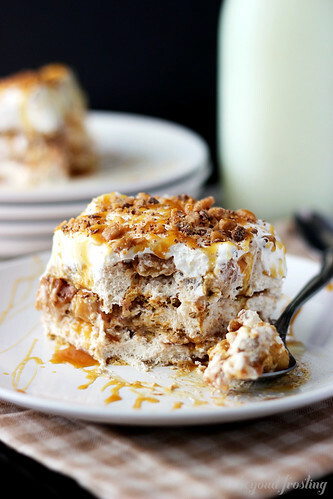 It was filled with brown sugar and cinnamon, pumpkin pie filling, crushed graham cracker and whipped cream. I must recreate that! I captured this action shot while I was patiently waiting for my dessert! Since I got back, I have been Baking baking baking and more baking. Welcome December! It’s crazy there are only 23 days until Christmas! I am always so excited for the month of December but, I feel like it can’t be here already. I haven’t really gotten in the swing of buying presents or decorating- yet! So as action packed as the next few weeks are sure to be, I am giving you a quick, no-bake dessert that is sure to please a crowd. I actually brought this into work yesterday and my boss was literally eating it by the handful HAHA! 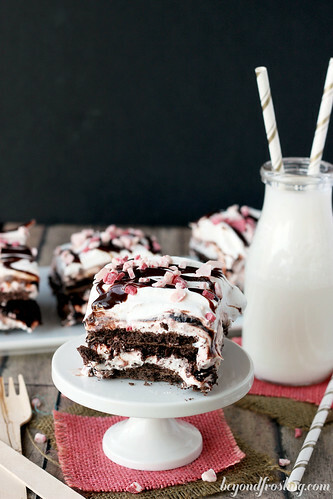 This is a Chocolate Peppermint Lasagna. 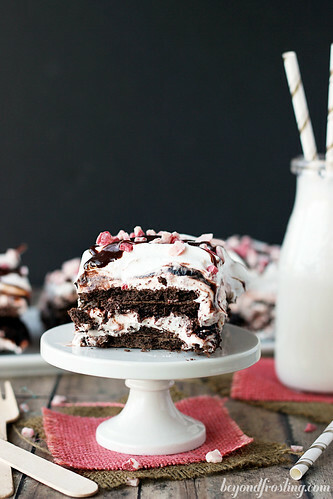 It is layers of chocolate graham cracker, dark chocolate pudding and a peppermint cream cheese filling; topped cool whip. The inspiration for this lasagna comes from my most popular recipe- Apple Pie Lasagna, which is the perfect fall treat and also my Pumpkin Pie Lasagna. 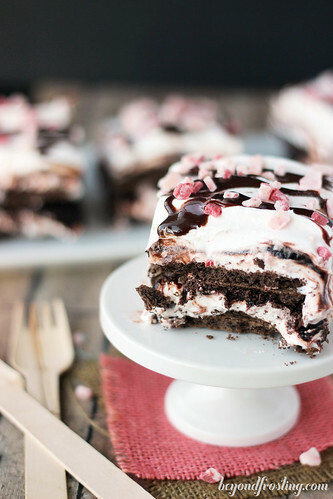 So naturally, I needed to make a chocolate-peppermint version for the Christmas holiday! This can be thrown together in about 15 minutes and kept in the fridge until ready to serve. I prefer to make this ahead of time so that the graham crackers soften up a bit. It is easier to cut through and the consistency pairs better with the pudding and cream cheese layer. The peppermint cream cheese layer is like a cheesecake- it’s so good! It is comprised of cream cheese, powdered sugar, cool whip and Andes Peppermint Chips. Prepare the pudding by mixing the dry instant pudding mix with cold milk and whisk until well combined. Refrigerate for 10 minutes until firm. While the pudding is in the fridge, prepare the cream cheese layer. Beat cream cheese on medium high speed until soft and fluffy. Add powdered sugar and heavy whipping cream and continue to beat on medium speed until well combined. Add a full container of cool whip, peppermint extract and peppermint chips and beat until all ingredients are well combined. 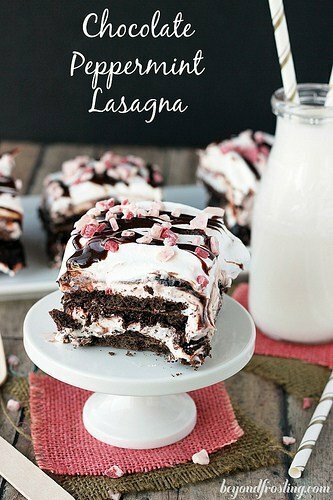 To prepare the lasagna, take a 9×13” pan and line the bottom with a layer of chocolate graham crackers. Next, spread half of the cream cheese layer over the graham crackers. Next, add half of the pudding mixture on top of the cream cheese. The next layer is a double layer of chocolate graham crackers in the middle. Top with remaining cream cheese mixture followed by remaining pudding mixture. The very top layer is an additional layer of cool whip; add as much or as little as you want. Top with additional Andes Peppermint Chips and drizzle with warm hot fudge sauce. 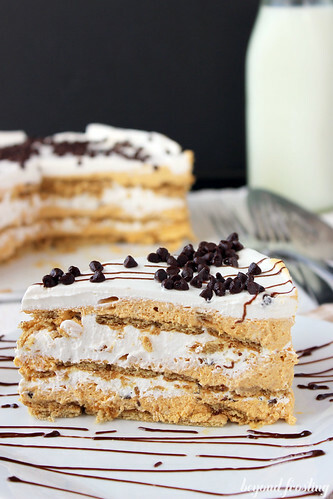 This dessert will serve a crowd- so it is perfect for a party! For added chocolate, you can double the pudding. If you can’t find chocolate graham crackers, you can substitute Oreos! Be sure to check out my other lasagnas! It’s extremely hard to find the chocolate graham crackers so I improvised with Nabisco Famous Chicolate Wafers. 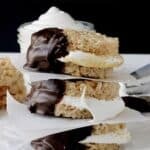 I used 2.5 boxes for the recipe because I doubled them up to make them thicker like graham crackers! Turned out delish! Does it matter if you use a glass, metal or ceramic baking dish? Does it set any different ?